Looks really nice and is small. Easy to store when not used. It is also surprisingly effective. Easily sufficient for a 3 bed semi-detached house. I have one of these, really useful good price. Low noise, low energy use. Dehudifiers are a must in the UK, especially during winter. Best kept in the are where you hang your washing to dry. We couldn't be without ours in the winter for drying clothes, especially with 2 kids. Pair it with a heated drying rack and a full load of washing will easily dry over night. We've had a 20l Meaco for a couple of years now..and wouldn't be without it in Winter. Great for condensation on windows overnight, makes air easier to heat, dries washing overnight, and ours has a HEPA filter too. Love it. We have 2 similar to this one upstairs and one downstairs , we also run one in our static Caravan all year brilliant . Cost a few quid in electric but so what, cheaper than having to have repairs because of damp and mold. Can't fault Meaco. I've had one since 2014 and use it quite regularly, it's good for the winter when you need to dry clothes indoors that can't tumble dry! considering the 20litre, i would primarily need this for drying clothes. This is £52.99 through that link ??? There’s promotion message below the price you click on that to redeem voucher (save 56%) and then should come up £23.32 in the checkout . Look into a PIV unit. Absolutely brilliant. Feeds filtered air down from the loft creating a positive pressure in house. The positive pressure forces stale damp air out continuously. House smells fresher and no problems with condensation or dampness. In winter you also get the benefit of solar gain from the warmer loft air. Ours cost about £250 and easy DIY install. is it worth signing upto whcih for 15 kwid off and then …is it worth signing upto whcih for 15 kwid off and then cancellingconsidering the 20litre, i would primarily need this for drying clothes. You have to spend £200 to use the which trial, if you are buying two, then yeah it's worth it. I bought the low energy 20l meanco one awhile back for some reason. 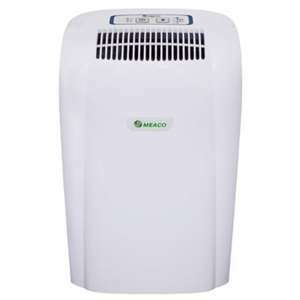 It appears to be a good device, it gets a huge amount of water out of the air in the winter as the relative humidity is high, although right now in the summer it’s a little useless, the readding it gives for relative humidity appears to be pretty low, so I guess I need a dehumidifier in the winter and a humidifier for the summer? as much water as it did take from the air in the winter I am not sure what good it actually did. We couldn't be without ours in the winter for drying clothes, especially …We couldn't be without ours in the winter for drying clothes, especially with 2 kids. Pair it with a heated drying rack and a full load of washing will easily dry over night. By that point why not just put the clothes in the dryer? At the risk of asking a stupid question, what's the purpose of a dehumidifier? Is it only for when your house is damp? I live in a new build and haven't seen any damp or condensation at all, but I've never owned one of these before either. At the risk of asking a stupid question, what's the purpose of a …At the risk of asking a stupid question, what's the purpose of a dehumidifier? Is it only for when your house is damp? I live in a new build and haven't seen any damp or condensation at all, but I've never owned one of these before either. If you don't get condensation on your bedroom windows in winter (when your heating is off overnight), when drying clothes, or excessive moisture in your bathroom, then don't bother. But if you do need one, get this. Great bit of kit. I've had mine 7+ years and I can't fault it. More expensive than an electric heater, AND a dehumidifier? I'm not so sure. Both of those need to run all night for a load, while the dryer might use more power at peak times, it doesn't need to run for nearly as long. I also tend to find line-dried clothes are not as soft as stuff out of the dryer. I didn't think many modern textiles had problems with shrinking? I guess it depends what kind of clothes you tend to have maybe. More expensive than an electric heater, AND a dehumidifier? I'm not so …More expensive than an electric heater, AND a dehumidifier? I'm not so sure. Both of those need to run all night for a load, while the dryer might use more power at peak times, it doesn't need to run for nearly as long. I also tend to find line-dried clothes are not as soft as stuff out of the dryer. I didn't think many modern textiles had problems with shrinking?I guess it depends what kind of clothes you tend to have maybe. My tumble dryer uses 3kw of electricity and takes 2h to dry a full load properly. My dehumidifier and drying rack use about 600w when both on. So 10 hours is about the same. I do agree that clothes are much softer coming out of the dryer though. Shrinkage is still an issue though clothes only shrink once, i.e. the second/ third time they are in the dryer they won't shrink any more.